Introducing the Orange Terror Bass amp & OBC112 cab: From humble origins (a shop full of guitarists) 50 years ago, the Orange Amplification Co. has grown and remained relevant (across generations and genres) and it's products still instantly recognisable to both the eyes and ears. The new Terror Bass head and OBC-112 bass cabinet tick all the boxes and follow Orange's simple but effective formula for the art and science of instrument amplification. 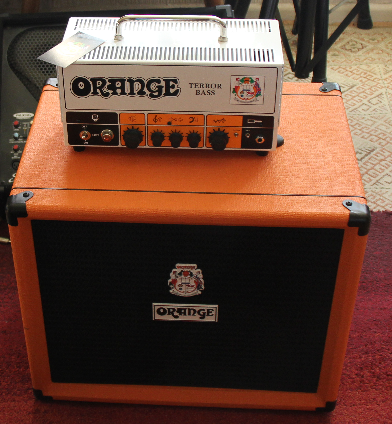 The mid-priced Terror Bass offers similar sonics to it's more expensive Orange stable-mates with less tweakability and only a single tube stage on the input although a send (also tube) and return (solid-state) allows use of external pedals and FX; also featured is a high-quality balanced DI out on XLR with a ground lift if needed. The original Terror design format dates back over a decade with the Tiny Terror guitar amp (and later variations such as the Dark Terror) and then the first Terror Bass series including 1000W and 500W models based on the A200B tube stage but followed by a solid-state output. The new Terror Bass follows this concept but with a few updates. The portability of the Terror's lunch-box design has the same appeal now as then but whatever the size and weight (which is healthy for the size) the Terror sounds like an amp should. Single channel; hybrid Class D power amp with valve preamp; clean switch, variable input sensitivity (in/out) for passive/active basses; balanced DI out; FX loop; volume, bass, mid, treble, and gain dials. Output power: 250 Watts into 8 Ohms; or, 500 Watts into 4 Ohms. Effects loop: 12AT7 valve-driven send and solid-state return. Price-wise the Terror Bass sits midway between a lot of decent bass amps but the review isn't so much interested in it's relative price but more the bang-for-buck (how is the money spent on materials, components, etc.) and the similarities and differences between other amps whatever the cost. There's no tuner, or inbuilt fx, or foot-switch or phrase looper...just an honest amp with gain stage and simple 3 band EQ and a send/return and DI out. The Terror Bass sits midway in the Orange head range too but offers some of the sonics of the top of the range all-valve AD200B MK3 and is a cut above the lower-priced range in terms of sonics. Reviewing the ADAM S3V 3-way studio monitor revealed how well Class-D amps can represent bass (especially in terms of square-wave activity). Tight with tone and feel without mud. Although the Class-D implementation is different for this application, I can see (and hear) the positive characteristics of the amp design...and, of course, paired with the valve front-end gain stage to add a complimentary character and feel. The hybrid 'tube-solid state' works well in this application. Beyond sonics, the further advantages of Class-D are weight saving, cost and power performance. Modern bass amps can be light, compact and powerful. Birch is a musical tonewood too (acoustic, semi-, and solid-body guitar; drum wood; and mallet wood) and has resonance at the low and high frequencies that speakers can struggle to produce and, if designed so, can compensate for high and low-frequency roll-off . Birch is known for 'natural EQ' and also beer can be made from it (although I may need to prove this). The delivery guy turned out to be a bassist, and guitarist, and keyboard player. I asked him if he'd heard of Gearslutz. He had (but seemed cautious). I invited him in to my modest home project studio and he parked the lorry. He stayed for a while and we talked gear. Real nice guy; he makes his own guitars. He gave my some great pedal tips! I opened up the 2 well-packaged boxes. The Terror Bass (TB or 'Terry') amp head is packed inside a high-quality padded camera-case style kit bag with the chrome handle of the amp poking through a slot in the top of the case. It's a very good quality case with space for cables and can be shoulder strapped. This means it's possible to carry the amp hands-free, a bass guitar in one hand and the cab in another...quite comfortably. The OBC-112 bass cabinet had an immediate 'not new' feel (in a good way, like comfy slippers) – it just sat there being orange. Physically it had some late 60's divine proportions in its dimension and form and it sat connecting ground to air like an Earth Mother. The Terror Bass amp sat atop the cab in splendid 'vintage white' powder paint finish with orange and black detailing. Really a work of technological art. With the TB's knock-out looks and the thoughtfulness of the design/function, first impressions were very good. I wasn't familiar with Lavoce, the company that manufactures the 12” neodymium speaker but they have a lot of experience in speaker, and other audio component, manufacture. Their website is interesting for geeking on components and tech info. Having played the Terror Bass/OBC-112 combo, I think Orange have made a good choice in that the speakers convey the 'Orange sound' well ...kinda modern easy presence with vintage growl. Next points of scrutiny was the detail of the finish, the mechanical points like joints and seams – any sign of sloppy finish or poor quality-control? None. Solid engineering and materials; this extended to the input and output sockets, DI out and insert points, and the Speakon sockets. Zero play in the rotary pots and switches; firm action from the single push-button (for ground lift) and the rear (4/8 Ohm selection) sliding switch. The attention to detail with the finish extends to the inside too – the 'vintage white' paint and shielded valves visible through the beautifully-cut ventilation slots. Great to see such well-built, solid gear; it inspires confidence in the product(s) and this is a reasonable expectation given the price. My initial thought, before switching on, was that materially, and in design terms, the Terror was good value and well spec'ed. I realised that I didn't have a Speakon cable. I needed to buy one and wondered if I needed a specific type: Orange do have their own brand and although they are more expensive than generic types they look very good quality. Probably a good bet for long-term ownership. I used a bog standard cable and it sounded fine but I didn't compare with the Orange version. Cables matter! As soon as I switched on (and left in Standby for at least 2 mins for the tubes to warm) I got a pleasing warm, clear sound. Not forced; nice natural presence in the room without smudging or blur down low. I cut the bass a tad and moved the mid dial down and just enjoyed jamming and exploring the Terror Bass/OBC-112 and how it interacted with the Ibanez SR500 4-string bass guitar (on which I left everything flat). Tweaking the 6 dB Pad on/off reduced the output level (or raised it) and this might vary from guitar to guitar depending on the impedances involved (and the cable); I detected a difference in the tone of harmonics. The Clean switch added a clear, creamy high 'ceiling' – extra space for the dynamics; and off a slightly dirtier, grungier tone but also warm, pleasant and sweet depending on the way the bass is played. The Clean switch is a new addition over the previous Terror Bass amp and it's inclusion adds to the flexibility/range and usefulness of the Terror. The volume, bass, mid, treble, and gain all worked as expected with a high-quality dial feel (haptic) and good ergonomics for the large dial size - particularly useful when tweaking the volume and gain to find a balance between clean and coloured. The filter controls are more useful as a timbre EQ to tune the amp to the room/environment/ambience rather than enabling wide-ranging, do-all, SSL-type utility EQ. I didn't do a lot with the DI and FX loop but it is high-quality and I'd have no problem using the DI sound alone if it is needed in the track; for live use DI allows connection to the mixer or studio-rack gear FX chains. The immediate impression is that the Terror Bass and OBC112 are fun to jam with as the bass is well-defined without volume and you get a sense of presence like a good bandmate in the room to support you. Visiting guitarists wanted to hear and play through it; the Orange mythos and logos attracted musicians to my modest studio like bees to amber honey...or cats to cream. The Orange Sound: Here's a few quick audio examples from an Ibanez SR500 bass: with mic, with DI and mic/DI mixed. It's not too useful to demo the full range of EQ controls as this is quite room specific in terms of recording so I'll just run with my favourite room sound setting with (boost) and without (cut) the mid EQ. The signal chain is: Terror DI out to BAE1073mpf pre (w/50dB gain); and a WeissKlang V13 mic on the OBC112 cab (around 6” diagonal off-centre position) and into a BAE channel (w/35dB gain). Both the channels straight into Propellerhead Reason via RADAR Studio conversion. I tracked at quite low amp levels (early evening/residential area) hence the high dB gain on the BAE preamps. The low self-noise of the Terror is a boon. Absolutely loved playing Tele through the Terror; it'll probably thicken up a Strat well but maybe too rich for other types. With a (Lexicon MPX110) tremolo in the send/return loop the weight of the Terror added that beautiful throb and clean highs. The Hudson Goldstar (ES295-style) semi-acoustic; Taylor 414ce electro-acoustic; budget lapsteel - all benefited or created interesting ambient textures...especially with big reverbs in the fx loop. In this sense, in a smaller way, the Terror/112 cab reminded me of the early large combo amps which might accommodate several instruments/sources simultaneously. There was a nice workable soundstage from the Lavoce although more boutique-sounding (Orange house-style) than a clean full-range amp. Out of respect (for Orange, my neighbours, and Moog) I didn't test the SubPhatty monosynth. Call me superstitious but it felt like mixing fire and water. Too much alchemy for me with my level of acoustic treatment. I'm not a cab expert but I am an engineer and I thought the OBC 112 cabinet build quality was OK for the money; the orange vinyl can scuff quite easily but every scar tells a story. The top handle is a rubberised plastic secured by hard plastic ends and attached by single Phillips screws to the cab. ; it's soft and pliable and the handle stretches slightly to accommodate the modest weight of the cab. It is quite robust but this might be a weak point for regular use especially when twisting around corners or avoiding objects e.g. public transport or in/out of vehicles. Hopefully I'm being over-cautious but it's reassuring to see that a new handle could be easily fitted if needed. The speaker (and cabinet resonance or lack of it) handled everything I threw at it in terms of energy but I was pleasantly surprised at the resolution and detail at quieter levels too; this is good for recording the cab with a mic and aided by the relatively low self noise. The circular rear port was silent and I heard no undue cabinet resonance from the birch ply construction. The cabinet sounded 'musical' - like a finely-tuned instrument in itself. It's a cliché but fair to say that the tone, the mojo, the vibe, in the fingers. That's a given. What then, if you're such a talented individual? I assume you can get a lot out of the Terror Bass, more than I'm capable of. I never felt like I reached a ceiling or threshold of playability and possible tone; it would take years of use to discover that, and the idea that it's an amp I could grow with, that it wouldn't be a limiting factor as I improved as a bassist, is what makes it distinct from 'one-trick pony' cheaper amps/combos. It's quite loud if needed, whilst maintaining a good range of tone/character, and flexible too. The Terror Bass amp and OBC-112 cabinet is a good combo for light-to-medium gigging or mobile remote sessions; the physical size and weight allow for short walk, public transport or car-share (or unicycle!). I don't gig bass a lot but I play most days. I'm writing/reviewing from a home studio musician-recordist perspective; please check other reviews if you need detailed advice about live use. I didn't try it with 2 cabs but I think that's advisable for larger gigs or loud 'competitive' jams, especially with medium-to-strong inexperienced drummers. That said, I've carried a lot of gear in my time...poweramps and all. I like to keep as fresh as possible before a gig – no stress on hands – so the logistics are good on this one. The Terror/112 made it more appealing to be out gigging and that's not just the portability....but also the sound. Terry's All Gold: Over 50 years Orange have transitioned well from the traditional style of amp-making to a new era filled with 3D printers and additive manufacturing. Sure, there's still real tubes inside but the classic design and detail is improved by the technology of the age. A real amp – all analogue with simple controls and a few extras to integrate into modern workflows: for high-quality lightweight/portable live bass; studio tracking/practice; and studio recording. The major update over the previous Terror Bass model is the clean switch (which adds headroom) and this is a success given that it broadens the tonal and dynamics palate of the amp and it's interaction with a variety of guitars. Audio gear tends to have an operational sweet spot; this is true of the many Gearslutz review products...often expensive gear will have a wider sweet spot or more linearity (or colour) across it's range of use. The Terror Bass and OBC112 deliver a first-class sound for studio tracking and small gigs. You do get character with the 'Orange sound' – clean, warm, present with full bass and nice mid edge – but there is still some room for fine-tuning the Terror's tone to suit a range of genres and with the variation of pedals pre or post the input stage, and the DI out. The volume, gain and EQ dials allow of range of tone and vibe but not an imitation of all and everything. Sound Quality 5/5 The Terror Bass sounds Orange. Warm, sweet, chimey, bell-like, with a velvet edge. Snarl available. I'm no bass expert; from a player-recordist perspective the Terror provided all I needed to focus on the performance: the clarity and presence of the bass signal and the resolution allowed me to fine-tune the fingerage and bring out/hear the nuances (which improve recording and performance). I wanted to mic this amp because it had a sound that motivated me to record it and position it in the mix. Ease of Use 5/5 Even a monkey could operate this...not exactly rocket surgery. The only setting the amp won't sound good on is when it's resonating with a room mode or rattling shelves – otherwise it's a matter of taste. Flexible enough to be used for electric 6-string or lapsteel for that speciality sound. Light and portable; needs it's own seat on the bus. Features 5/5 Useful range of tone-shaping and harmonics; send/return; DI out; Standby mode. Just the pure features, the important stuff without compromise. No tuner or minijack in or led's or display or Bluetooth or DSP. Bang-for-Buck 5/5 For my marking a 9/10 with the craftsmanship of the amp being the stronger value proposition. The price is reflected in the design, materials and finish; the sonics; and usability. There are cheaper (arguably lesser) offerings in a busy market but the Terror amp in particular feels top-quality; the OBC-112 cab is more traditional and the value is less obvious on the outside but inside the Lavoce speaker and driver feel to be working comfortably. Photos used courtesy of Orange Amplification Co; additional photos by Arthur Stone. Last edited by Arthur Stone; 4 weeks ago at 03:02 PM..